Special Price expires on 6/30/2019. THE FRESHNESS DATES ON THIS BATCH IS NOVEMBER 2018 AND WILL BE GOOD TO DRINK FOR SEVERAL MORE MONTHS. PRICED TO MOVE NOW!! ONCE THESE ARE SOLD THERE WILL BE NO MORE AT THIS PRICE!! 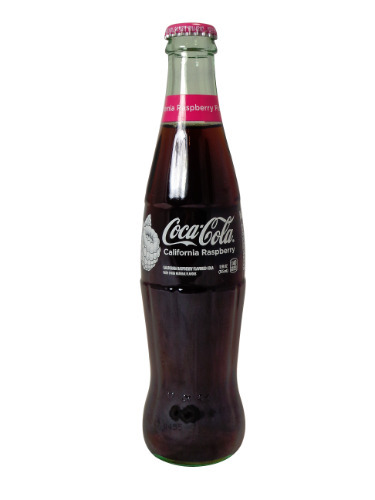 12oz glass bottles of Coca Cola RASPBERRY with CANE SUGAR!! These are absolutely awesome!!! Hard to believe it took Coke so long to put out a cane sugar based flavored cola in the US!! But still so happy they did! So much better tasting with sugar and no aftertaste from cans!! Love the bottles too because the crowns are NOT twist off, you must use an old-school bottle opener to get these baby's open to drink! Love it!! Taste wise when we first opened the bottle the raspberry flavor is not overwhelming, it is pretty subtle. The taste of the Raspberry cola is SOOO GOOD! But I am biased because every time I am around a Coca-Cola Freestyle machine I always get Raspberry Coke. Just like the aroma, the amount of raspberry in each drink is fairly subtle. Its so much fun drinking an old school glass bottle Coke, this time with raspberry. Heaven in a bottle!! Great job Coke! !